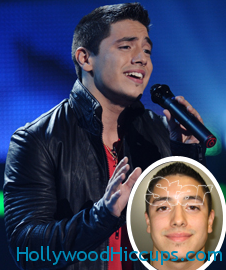 American Idol’s cutie pie, Stefano Langone had a near death experience when he was hit by a drunk driver and was thought to be dead at the scene. His story is so touching and the fact that he rose above it and kept singing is so beautiful. Well, thanks to Star, that perfect picture is now flawed. pulled over by a Washington State Patrol trooper for speeding and changing lanes without signaling. After failing field sobriety tests — including not being able to recite the alphabet — and registering above the state’s legal alcohol on a preliminary breath test limit, he was arrested on suspicion of driving under the influence of alcohol. “While en route [to WSP headquarters], Langone began singing,” stated the arresting state trooper in his report. OMG, he was singing?! I will not judge Stefano for making a huge mistake. No one is perfect. But yeah, the shock value of that is pretty intense. But you still have to love him and you should still keep voting for him America.